A portrait of Her Majesty The Queen depicted standing on the Cosmati pavement in Westminster Abbey has been moved to Cheyneygates, one of the spaces at the Abbey available for hire, for day and evening events. Originally available to view as part of a temporary exhibition in the Chapter House, it is now possible to see this extraordinary painting by attending an event held in this space, which was originally part of the Dean’s home. In a rare act of acquisition, supported by private donors, Westminster Abbey acquired the painting ‘The Coronation Theatre: Portrait of Her Majesty Queen Elizabeth II’ by Australian-born, London-based artist Ralph Heimans, for its collection, last year, as part of the celebrations for the 60th anniversary of The Queen’s Coronation. 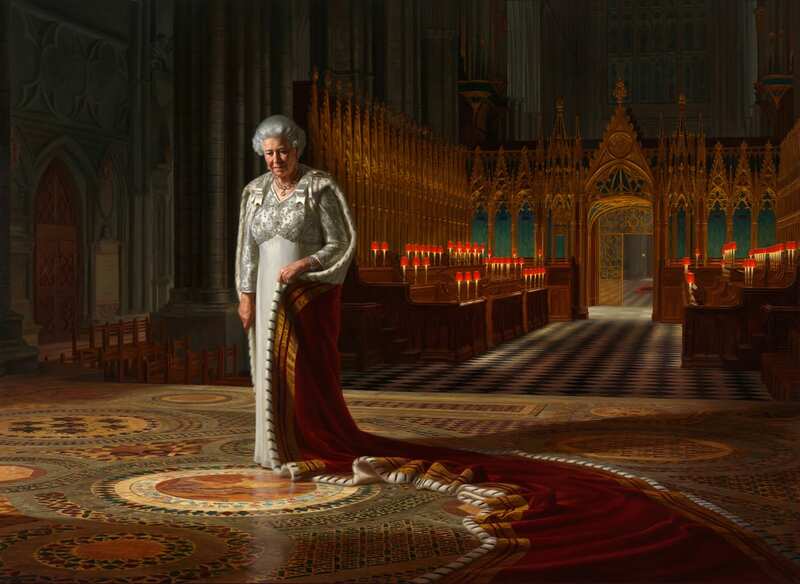 The ambitious and large-scale 9 x 11ft painting (oil on canvas) depicts The Queen in a unique and highly symbolic setting, the Sacrarium of Westminster Abbey, sometimes described as ‘The Coronation Theatre’. It is an imagined scene set at night in Westminster Abbey showing The Queen in a moment of solitary reflection and is an exceptional interpretation of the intricate mosaic patterns of the 13th century Cosmati pavement. Half day, and day delegate rates are available. For further information on booking Cheyneygates please contact bookings@westminster-abbey.org.